As we power up the Jalopnik laptop each morning, we're usually greeted by a period shot of Pete Brock's BRE racing team circa 1971: driver John Morton, Brock and engine chief John Caldwell, along with the Datsun 510 racer the team ran in the SCCA Trans Am series that year. That the Jalop comprises all manner of 510 geeks is no secret, which is why we were plenty psyched when Autoblog picked a restored, tuner model as its reader ride of the day. 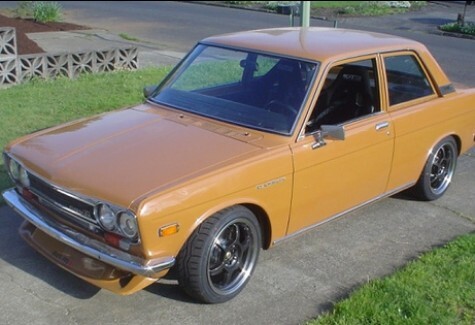 It's a bit of a Frankenstein's monster, this butterscotch brown '72, sporting BMW headlamps, a suspension fitted with bespoke swaybars, and a turbo-boosted Nissan SR20DET under the hood producing 300 hp at the wheel. It even has a BRE-style air dam, which all proper 510s should. Click through for more Datsun geekery, in the form of John Morton's commercial for the original 280z.